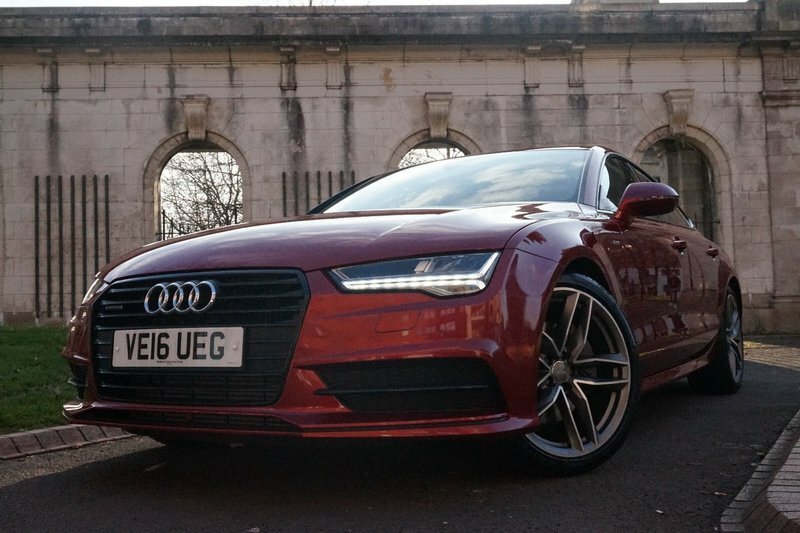 An astonishing one former owner Audi A7 S Line Black Edition in Tango Red. Features with BOSE Surround Sound, 20" '5-twin-spoke V' Alloys, Sunroof, Audi MMI Nav, Valcona Leather, Elec/Heated/Mem Seats, Audi Parking System+ (F&R Acoustic with Visual), Auto Elec Tailgate, and Cruise Control. Last full service done on 20/03/18 at 9933 miles. First MOT due May 19. Spare key included. Still under manufacture warranty until May 19, Low rate Finance package available! Drive away same day! PX Welcome! 12 Month AA Break Down Cover! We are open Sundays too! Please call to arrange an appointment! No admin fees or any additional costs at point of purchase!